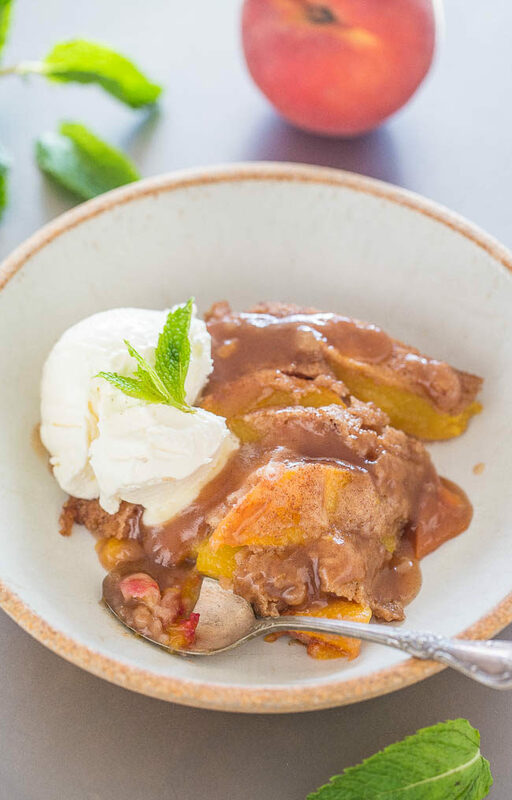 If you’re looking for a traditional peach cobbler recipe, this isn’t it. You know the one with blobs of flavorless biscuit dough. I’ll never eat that again when I can have this instead. It’s an easy, stir-together dough and there are no eggs, oil, or butter. Just flour, sugar, milk, cinnamon, and peaches. Super basic, easy, and the perfect way to use summer fresh peaches. I recommend fresh not frozen and you could probably mix-and-match the peaches with other stone fruits like nectarines or plums. Turn the dough out into a pan and then pour a sugar, water, and cinnamon mixture over it. As you’re pouring this watery mixture over the dough, you’ll think to yourself there is no way this will ever work or set up but it does. And it’s so good. The recipe reminds me of both my Slow Cooker Hot Fudge Chocolate Cake and Slow Cooker Banana Bread with Brown Sugar Sauce because in both of those you pour water over dough and during cooking, a self-forming sauce is created. The same thing happens here. Let me tell you the sauce is wonderful. 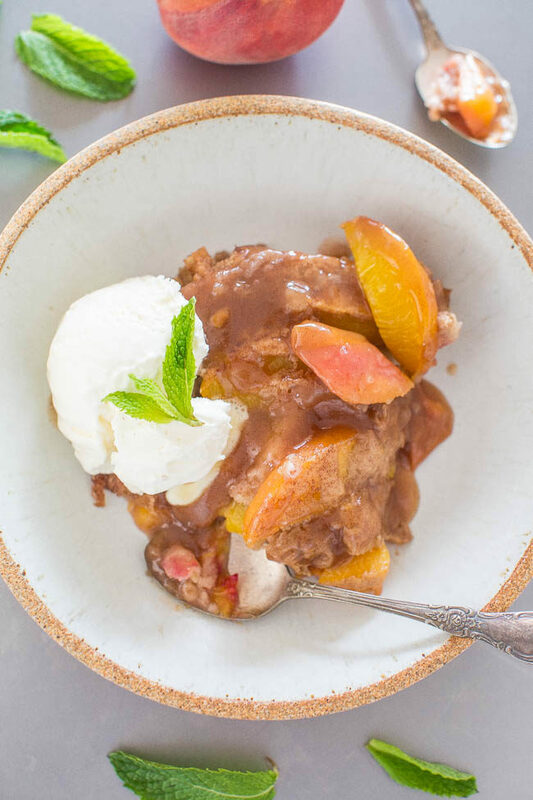 It’s got just the right amount of cinnamon to add interest and flavor to the peaches, it’s wonderfully sweet, and reminiscent of caramel sauce. 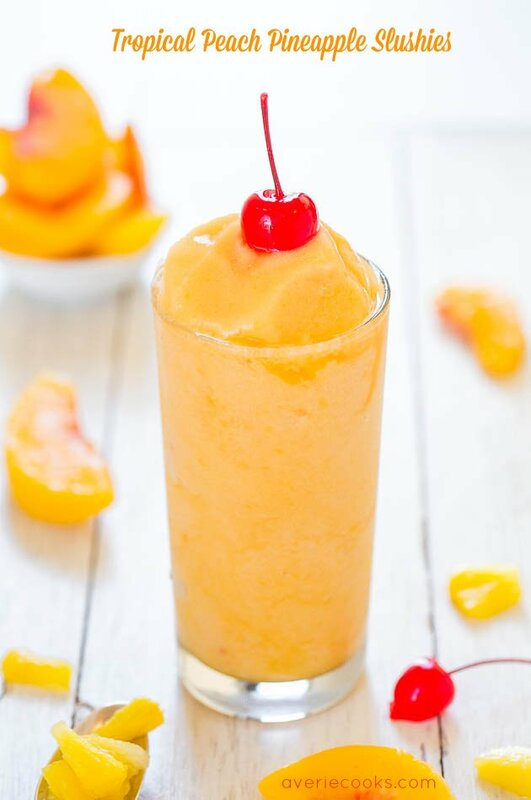 It forms underneath the juicy peaches and you’ll want to drink it. I made the recipe in an 8×8-inch pan and used 4 medium/large peaches, a solid 4 cups. I literally had no space at the top of my pan and an overflow could have easily happened so I suggest using a 9×9-inch pan if you’re using 4 full cups of peaches like I did. You’ll probably be able to decrease baking time by about 5 minutes baking times are just approximate here since no two peaches are exactly the same size or have the same juiciness level. Bake until the edges are bubbly and the center is set. Serve with a sprig of mint and a splash of cream, whipped cream, whipped topping, or ice cream for maximum decadence. Dough – Preheat oven to 350F. Line either an 8×8 or 9×9-inch baking pan with aluminum foil, spray with cooking spray, and set aside. If you’re using 4 cups peaches, use a 9×9-inch pan. Read blog post for more info. To a large bowl, add the flour, sugar, baking powder, cinnamon, salt, and whisk to combine. Add the peaches, milk, vanilla, and stir to combine. Turn dough out into prepared pan smoothly the top lightly with a spatula as necessary; set aside. Sauce – To a medium saucepan, add the water, sugars, butter, cinnamon (I used 1 teaspoon), and heat over medium-high heat until mixture is boiling and sugars have dissolved. Allow sauce to simmer gently for about 3 minutes, stir frequently. Evenly, slowly, and carefully (it’s hot, use caution) pour sauce over the dough. It looks like a liquidy mess, but it works out. Place pan on a baking sheet as insurance against overflow while baking, and bake for about 45 minutes (if using a 9×9 pan) to 50 minutes (if using an 8×8 pan), or until the edges are bubbling and the center is set. Dessert will set up up more in the center as it cools. Place pan on a wire rack and allow it to cool for about 20 to 30 minutes. Optionally garnish with mint, add the optional creamy topping of your choice, and serve immediately. Dessert is best warm and fresh but will keep airtight at room temp for up to 5 days. 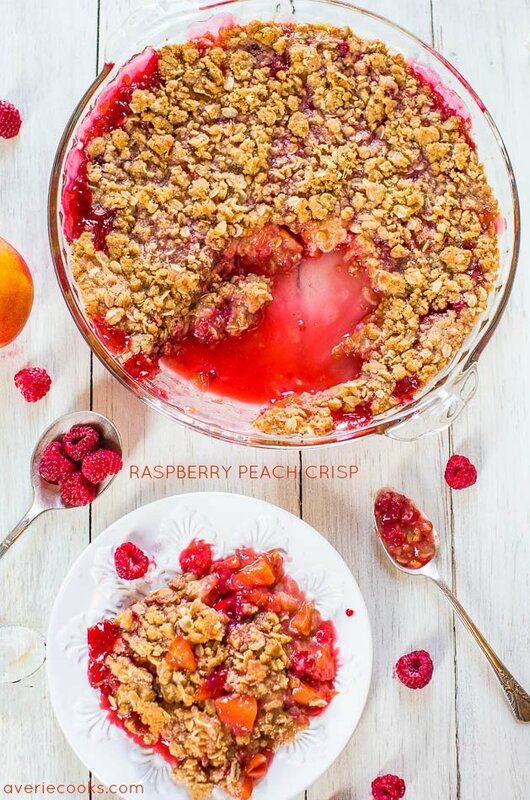 Raspberry Peach Crisp – Plump raspberries, juicy peaches, and a crunchy oat topping make this healthier summer treat totally irresistible! 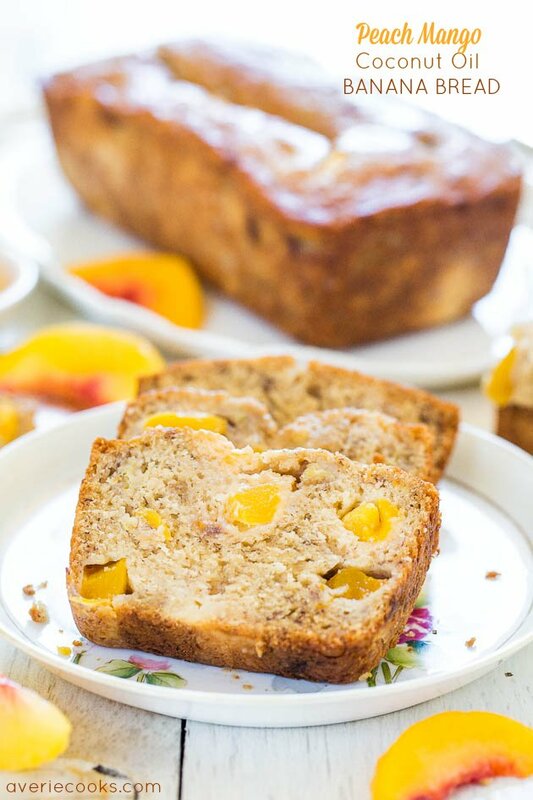 Peach Mango Coconut Oil Banana Bread – The softest, moistest banana bread that tastes like a tropical vacation! A new favorite! 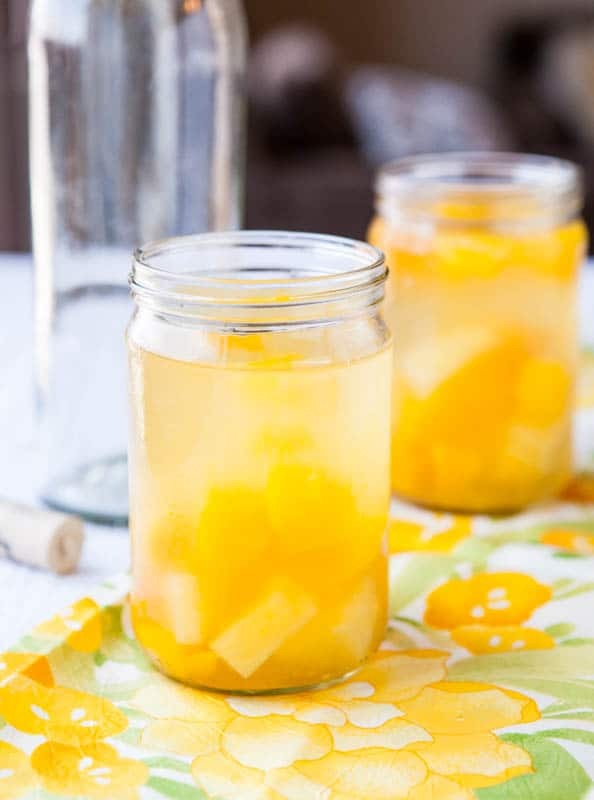 Peach Mango Pineapple White Sangria – Takes minutes to make & everyone loves it! A lighter & fresher alternative to red sangria! Make it for your next party! I agree with you on the biscuit dough. Does nothing for anyone. A sauce with brown sugary goodness, on the other hand…perfection. This is perfect! I love anything with sauce (and an ice cream garnish) so it’s quite convenient when the dish creates it’s own!! It is amazing to me how that works–both in a slow cooker and the oven but it’s pretty cool. I agree–blobs of biscuit dough couldn’t hold a candle to this! The self-saucing aspect of this cobbler really amazed me! It’s even more amazing in person when you see what the pan looks like before baking and then taking it out of the oven – so radically different! I thought I was the only one who didn’t care for blobby biscuit cobbler. This sounds fantastic and way easier than pie. Averie, I am getting a lot of pop-ups on your site–wanted to let you know. Ok thank you! I will talk to my ad managers. Oh my gosh that sauce is HEAVEN!! This is my kind of dessert! Yes, step 2. Fixed, thanks! I don’t see where the flour is added. Gorgeous, I just made a peach crumble. Love how cinnamon-y this is. One of my friends at work always steals everyones food but hates cinnamon so this would be safe LOL! hey girl this looks so tasty! YUM! This looks very tasty. I have made similar cobblers but never the one with water. We just cane home almost 2 weeks ago with 18 boxes of peaches from SC. We kept 2 for ourselves which was 80 pounds. I froze a few, canned some, made peach preserves, a crisp and a cobbler. We have eaten LOTS. HA! I still have a good many in the fridge. Need to try this now!! Thanks for saying hi! Wow when I saw your blog URL come up it was a total blast from 2010 or so :) Hope life is treating you right! And this would be perfect for your farmers market peaches! WOW! This looks so good. 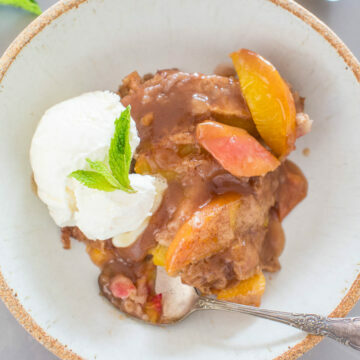 Peaches (and raspberries) are my favorite summer fruit and I love that you’ve added cinnamon flavor to the dough and the sauce!! Perfect recipe! It was really hard to make this look good, but thank you :) The sauce was SO.GOOD. Wish you lived closer! This looks gorgeous Averie!! Pinned!! This looks so amazing. I love all of that cinnamon goodness. I made this last night and it was amazing! I am more of a chocolate dessert person but this was so good, I will definitely make it again! I made a batch and a half (but didn’t up the sugars) and made it in an 11×9 ish pan – with a mix of peaches and nectarines. Served with vanilla custard it was delicious! I am excited that we have leftovers tonight. Mine was a little more saucy than yours looks but might be that I needed a few more minutes to cook, but mixing the sauce and the melted ice cream was really good at the end, so no one minded! Thanks again for another terrific recipe! Thanks for trying the recipe and I’m glad it came out great for you! The mix of peaches and nectarines with the custard sounds great – and yes that sauce with the custard, must have tasted heavenly! I made the recipe last night…oh so good! My whole family loved it with vanilla ice cream. Thanks Averie! Have a fabulous day!